Magnetic Vehicle Signs are ideal for temporary applications and shared (business / private) vehicles. Just about any design can be applied to the magnetic sign surface from simple text layouts to full colour photo images. 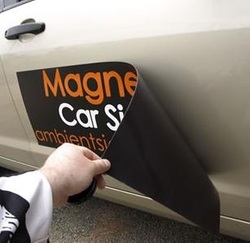 Our magnetic signs use the strongest available magnetic sheeting, unlike cheaper alternatives. Over-laminating our magnetic signs makes them last much longer. It protects the print from accidental scrapes which can ruin the prints on cheaper un-laminated magnetic signs.